Williams made his debut with the Giants in 1949 and stayed for good after the 1951 season, making the All-Star team in 1953 and appearing in two World Series (1951 and 1954). His career ended in 1955 after he suffered a back injury from being run over by Jackie Robinson while covering a bunt. Jaramillo is a baseball hitting coach, most recently for the Chicago Cubs. During his time with the Texas Rangers, Jaramillo was the first individual in Rangers history to serve more than eight seasons on their major league coaching staff. 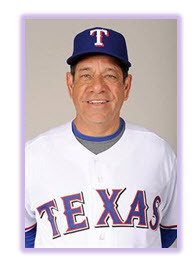 He served as the Texas Rangers' major league hitting coach for 15 seasons, from 1995 to 2009. Rudy also had the longest tenure with one team as a hitting coach in Major League Baseball. In 2003, Rudy was inducted into the Texas Baseball Hall of Fame. He was the 2004 recipient of the Texas Rangers' Joe Macko Award, given to honor his long and meritorious service to the organization. Baseball America, in 2005, named Rudy Jaramillo Major League Coach of the Year.